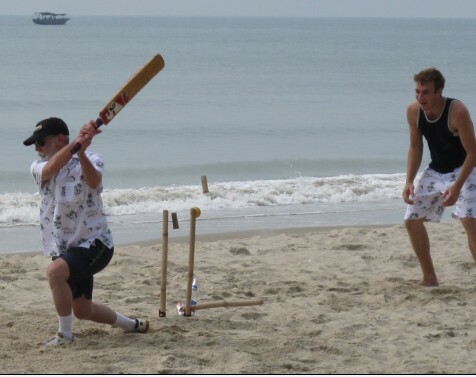 The Sanya Cricket Club is having another game this Saturday 12 February 2011 in Sanya Bay. Teams will be picked at 11:00 am on the beach and play will continue until the tide comes in. It’s high tide again this month, so play has to start early. The same section of beach in Sanya Bay will be used as last time, in front of Casa Mia and Fat Daddy’s, and a little bit along the beach, heading west (away from Phoenix Island). All those intending to play please meet at 10:30 am on the beach. Please tell your friends and bring your sunscreen and your official Peoples’ Royal International Cricket Club of Sanya uniform (more will be available for newcomers). Cool beer and water will be available. Families, friends, kids and dogs are all welcome.